Custom viewport backgrounds just the way you want them. 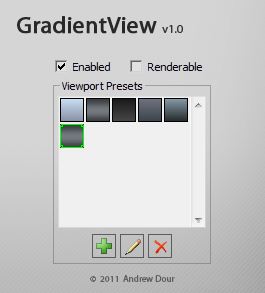 • Create your own custom gradients; no images needed. • Loads automatically at startup and with each new file. • Great for office/studio workflows: Doesn't save the BG image to the file, so you won't get missing asset warnings.